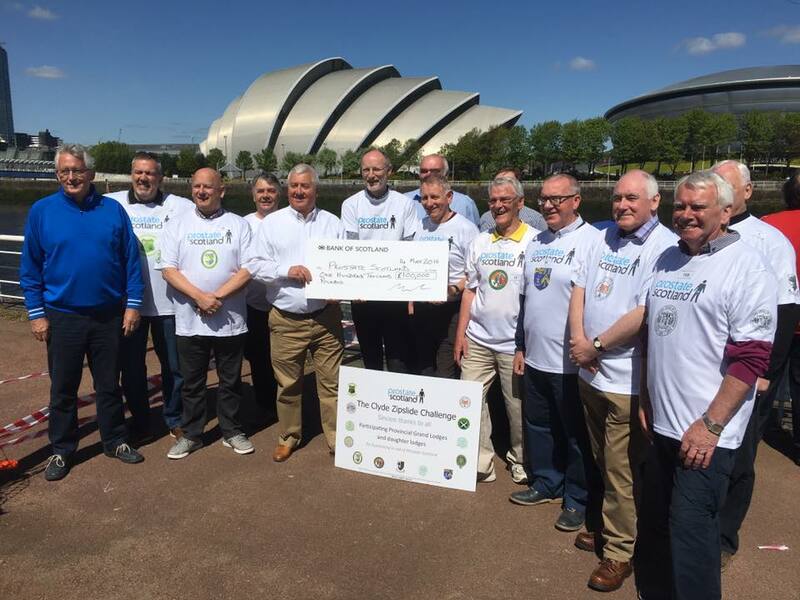 The respective Provincial Grand Lodges of Lanarkshire Middle Ward, Lanarkshire Upper Ward, Renfrewshire East and Renfrewshire West coordinated a sponsored Zip Slide across the Clyde on Saturday 21st May 2016. The Right Worshipful Provincial Grand Master Bro Alistair Marshall and Bros Andrew Goodwin, Alexander Dow Ure and Andrew Moodie from the Province of Stirlingshire took part in the event. The total sum raised for Prostate Scotland will be in excess of £100.000.00. The Members of the Province of Stirlingshire were delighted to contribute around £1,500.00 to this worthwhile cause. They would like to thank all who assisted them in their endeavours by sponsoring them to complete the Slide. The picture below shows various members from the four organising Provinces including Bro Tom Davidson Right Worshipful Provincial Grand Master of Lanarkshire Middle Ward who was the prime mover of the event. Thirteen Provincial Provinces in total participated in the event.